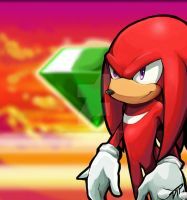 Wanted to make a more vibrant version of a Knuckles I did earlier in the year! He's definitely vibrant! Reminds me of a bizarre adventure. I'm glad you caught the reference.